A Hermes in Grand Theft Auto Online. "The Hermes is more legend than automobile. When all those 1960s classic muscle cars were still in diapers, the Hermes was already crawling down Eclipse Boulevard leaving a trail of unfiltered cigarettes and misogyny in its wake. With that kind of canvas you can paint a seriously offensive painting – and trust us, that eye-watering paint job is just the start." The Hermes is a customized late 1940's coupe featured in Grand Theft Auto: Vice City, Grand Theft Auto: San Andreas and Grand Theft Auto: Vice City Stories, and Grand Theft Auto Online as part of the The Doomsday Heist update, released on December 25th, 2017, during the Festive Surprise 2017 event. It is manufactured by Albany in the HD Universe. The Hermes, appearing as a two-door coupe, is distinguishable by its large body, but seemingly small occupant's visibility. The Hermes is based on the 1949-1951 Mercury Eight, with styling cues from the Hudson Hornet, but the car has been evidently modified into a lead sled, with a chopped roof and an additional pair of tail lights. The car's tail lights also resemble the ones on a Fiat Brava, minus one pair of its taillight stripes. The Hermes returns in Grand Theft Auto Online as part of the GTA Online: The Doomsday Heist continuation event, Festive Surprise 2017, on Christmas Day. The vehicle now assumes the design of the third generation Buick Super, while still featuring influences from 1949-1951 Mercury Eight in the overall shape, and details in the frontal fascia now more closely resemble the Hudson Hornet. A classic bumper similar to the Hornet's can be also bought from Los Santos Customs, as well as a livery referencing the Fabulous Hudson Hornet. 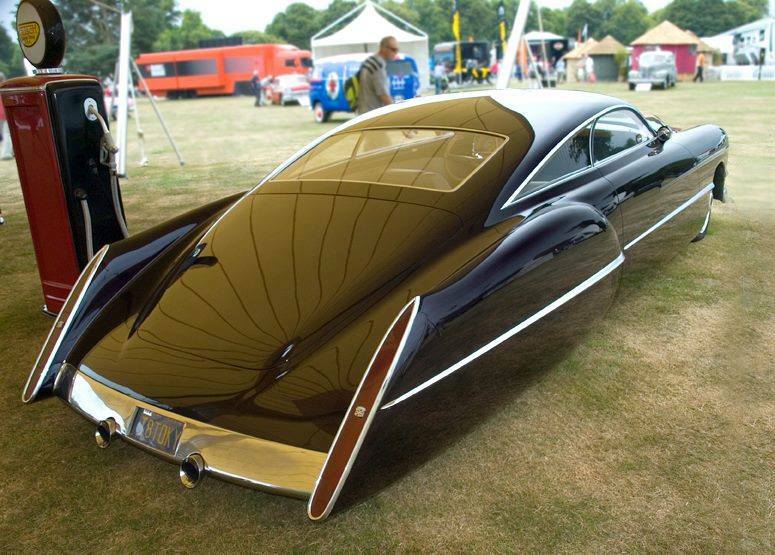 The rear lights and trunk have mild resemblance to the 1948 Cadillac "Cadzilla". If the rear bumper is removed it also seems to loosely resemble the Holden Efijy. The design is now modified into a lowrider, featuring a very sloped rear portion and numerous curves and arches. The rear wheels are hidden within the car's bodywork and chromed details are added to the front section of the vehicle. These features can be removed in Los Santos Customs. Like the Yosemite, the car has air-ride suspension; when at a stand still, the car lowers to the preferred suspension added in the Mod Garages, however, when moving, the vehicle lifts to give height between the ground and the car. This is particularly useful and helps to avoid scratching the vehicle. The lowest suspension modification for the vehicle clips through the ground, being the lowest any vehicle in GTA V and GTA Online can go. The Hermes uses the standard lowrider interior seen in the Peyote and Hotknife, with classic analog dials and a fabric dash. The car's performance could be described as average; its acceleration is underwhelming, but it has a moderate top speed. It is unusual in that it has front wheel drive (very rare in American cars of the period) and it cannot be blown up with a gas-tank shot like most cars in GTA San Andreas. The car is also prone to understeer, owing to its large size, small tires and front wheel drive. In GTA San Andreas the brakes are extremely inefficient and are among the worst in the game, but in the hands of an experienced player the vehicle may be used for drifting. Holding the brake and the handbrake simultaneously is a good way to increase the car's brake strength. However, this technique is still less effective to put the car into a full stop while sliding down the slope surfaces on a high speed. As it only has two doors, the Hermes can only seat two. The Hermes is a very stable and comfortable ride thanks to the air-ride suspension it possesses. Because of its length and shape, it struggles to make quick maneuvers, however the vehicle's purpose doesn't make this a huge concern. In terms of speed, once given time, it is very competitive against even some sports cars, exceeding most muscle cars, even with similar weight, however the weight does limit the vehicle in terms of acceleration, and huge amounts of wheelspin are present with hard acceleration, without modifying the vehicle's engine. Despite this, the Hermes still proves to be a steady, firm ride and doesn't tend to spin out of control, even during winter conditions, where road conditions are unpredictable. However, because it is top-heavy it has a tendency to flip over when cornering whilst hitting a curb or when cornering driving downwards or upwards a hill for example; this also happens on flat, straight roads. The Hermes' suspension raises while in forward motion, and lowers to its default height when stationary. The Hermes can only be modified at TransFender. The Cuban Hermes in Grand Theft Auto: Vice City Stories. In Grand Theft Auto: Vice City and Grand Theft Auto: Vice City Stories, there is a modified gang variant of the car driven by the Cubans, dubbed the Cuban Hermes. The Hermes on Southern San Andreas Super Autos. The Hermes on the Rockstar Games Social Club. ...and raised when in motion. In Grand Theft Auto: Vice City and Grand Theft Auto: Vice City Stories, the Hermes is commonly seen around Vice City. In Grand Theft Auto: San Andreas, the Hermes is mostly a gang car for the Los Santos Vagos and the Varrios Los Aztecas, and as such, it can be seen on their respective turfs. Commonly spawn around Ocean Beach, usually in the Ocean Drive, Washington Beach and Vice Point. As it is the gang car of the Los Santos Vagos, it is commonly found on their turfs which are: Las Colinas, Los Flores, and East Beach. As it is the gang car of the Varrios Los Aztecas, it is commonly found on their turfs which are: El Corona and Little Mexico. Commonly found around the whole state. Sometimes may appear in Starfish Island, Little Havana and Little Haiti. Can be purchased from Southern San Andreas Super Autos for $535,000. Players who logged in to GTA Online on December 25th 2017 received the option to purchase one at no cost. "Hermes" is the Greek name for the Roman god Mercury, which is also the name of the car manufacturer it is based on. However, Vagos will listen to K-DST or Master Sounds and Aztecas will listen to Playback FM, as both of these gangs drive these cars. In GTA Vice City, The Hermes does not feature a license plate, similar to the Comet, while the other renditions adds one on the rear end (directly on the trunk in GTA San Andreas and on the rear bumper in GTA Vice City Stories). Even though the Hermes in GTA Vice City Stories has dual exhaust pipes, the exhaust fumes are only coming through the right pipe. Upon closer inspection, the vehicle lacks any driving pedals, this is also found on the Roosevelt/Roosevelt Valor, Hotknife and the Z-Type. With the correct rear bumper, the player can remove the license plate, making it illegal on the road. The Hermes is one of two non-lowrider vehicles with an independent suspension, with the other being the Yosemite, which is also in the Muscle class, released in the same update as the Hermes. With the "Classic Hermes" livery and the corresponding color, one can recreate the Cuban Hermes. The "Amazing Albany" livery is a reference to the Fabulous Hudson Hornet. There is an error on this livery where the advertisement for Hayes Auto Body Shop on either side of the vehicle's roof is spelled incorrectly as 'Haynes Auto Body Shop'. When entering a facility the Hermes will bottom out and not complete the animation of it driving onto the platform. Some players report money being deducted from their account, despite purchasing the Hermes on Christmas day - December 25, 2017 - when the Hermes was FREE. This is potentially caused by the awards message not appearing in-session straight away, and the Hermes' sale price displaying as "$535,000", rather than "FREE" on the day. Waiting a few in-game minutes would see the awards been given and the price changed to FREE. However, many PC users were deducted the full price even after the message appeared and was listed as being free on Southern San Andreas Super Autos.